Every community has a unique set of characteristics that add to the quality of life for residents and visitors. Factors such as critical viewsheds, important wildlife habitat, historic resources and recreational amenities all contribute to the conservation value of a locale. CTM has developed a methodology to identify and prioritize areas for land conservation based upon their natural and cultural resources along with their development potential. This methodology highlights lands that have high resource value and are likely to be developed based upon landscape constraints. 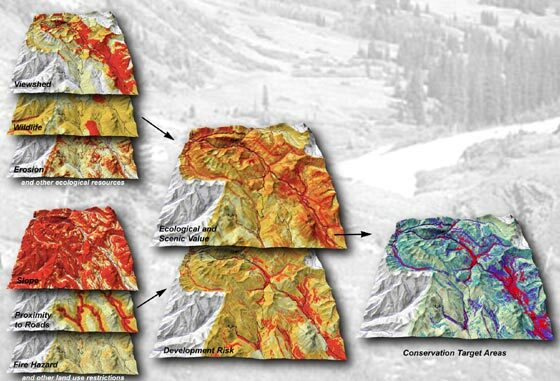 We've applied this methodology in diverse settings - from high country landscapes dissected by private inholdings to agricultural lands threatened by encroaching development. The ability to tailor the process to the local setting is vital to the success of any conservation-related project. The analytical results from these projects form the launching point for future implementation and funding efforts. For example, our conservation planning project contributed to a $5.7 million award for on-going conservation-related work along the All-American San Juan Skyway in southwestern Colorado. If you would like to see samples of our conservation projects, visit our conservation projects portfolio!